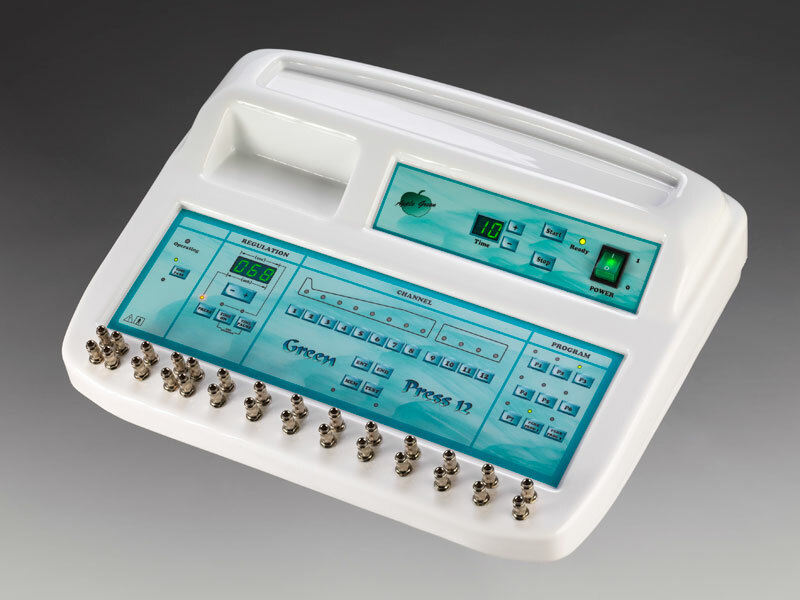 The GREEN PRESS 12 has been designed on a principle of manual lymph drainage. The special cuffs are controlled by microprocessor what allows a selection of the precise treatment parameters. There are seven pre-set programs for optimal therapy of different conditions. Additional 14 programs are free to be created by the user according to her/his experience and needs. The cuffs consist of compartments which partially overlap what enables lymph drainage in the most natural way. The compartment pressure is adjustable and can be easily controlled via front board of the instrument. Two cuff models are available with the machine. They both allow treatment of the arms (one or both simultaneously), legs, buttocks and abdomen, the only difference is in design and material they are made of. The Green Press 12 is an excellent additional therapy to the manual lymph drainage in every physiotherapy unit. Its therapeutic effect is a valuable contribution to the treatment of early as well as advanced stages of various pathologies. When supervised by an expert, it can be also used in cosmetic salons for effective treatment of all cellulite stages. In a combination with other established cosmetic procedures (ultrasound therapy, electrotherapy, anti-cellulite creams, etc.) the final result in reducing the cellulite appearance is even more impressive.